Here I want to show some examples for laminate flooring cost estimates that will include all the expenses that may be included when you have laminate flooring installed. The examples I'm using may not be based on the exact amount you may need, but it may help you to get a rough estimate of what it may cost you. I am aware that the costs of materials and labor can vary depending on where you live. A lot of folks don't have any idea as to what it will cost. I will give examples that will show a ballpark figure that may be based on different amounts of flooring, installing it yourself, having it done by a flooring retailer or buying the flooring and hunting down a laminate installer yourself. To know what it will cost to have laminate in these areas you will need to figure the amount needed first. Next you will need to address the base board or quarter round by measuring the walls to see the total length of these needed. Other factors to consider are, how many transitions?, underlayment?, installation labor cost? Sub Total = 256 sq/ft Add an additional 10% (26 sq/ft) for waste and mistakes. Of coarse the cost of laminate flooring can vary anywhere from .69 to 4.00 or more per square foot. Here are a few different scenarios for just the cost of the laminate. 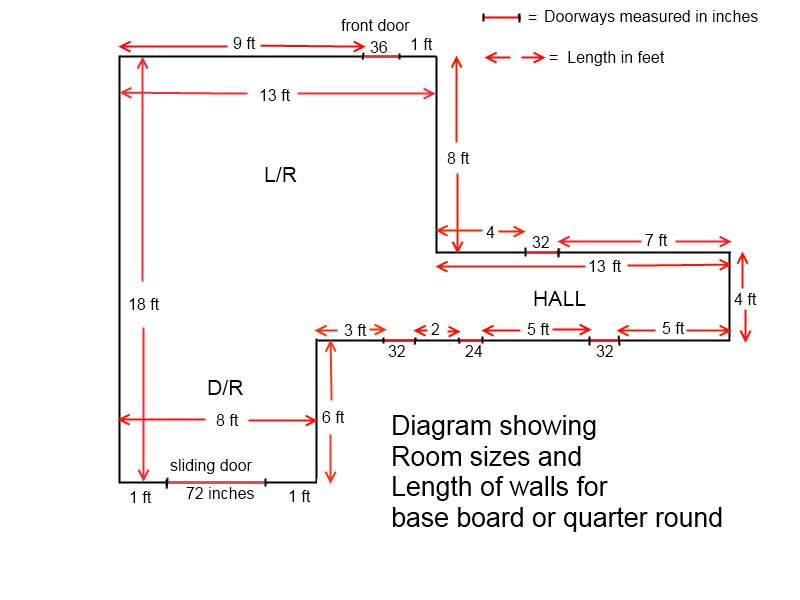 In the diagram above there are measurements along every wall. All that needs to be done is to add all these together excluding all doorways to get the amount of base board or quarter you will need. The total amount of base board or quarter needed will be 74 linear feet. This is the distance around every wall without the doorways. It is a good idea to add extra in case of mistakes, and also to cut down on joints. I would add 8 feet in this case, making the total 82 feet. In my area quarter round cost about .50 to .60 a foot at Home Depot or Lowes. This is a wood product which is primed and ready to paint. 82 X .60 = $ 49.20 Cost for quarter round. Base board is more costly, it can cost from 1.00 up to 4.00 or more per foot. I have noticed that some of the big box stores will sell bundles of base board at substantially lower cost, 10 per bundle at 12 feet in length (this is at Lowes). There are a lot of different underlayments on the market. They can range from .20 to 1.00 per square foot. You can get a pretty good underlayment for around .50 t .60 cents per square foot. When ordering your underlayment you do not have to purchase extra as when ordering the flooring. For instance if you needed 941 feet of laminate including the waste, you would only need to order 900 feet of underlayment. In our example you will need to order 300 square feet as most underlayments come in 100 foot rolls.